The last products created by SR&D, in 1993-1994, clearly show a lack of inspiration and difficulties to follow the market trends. The digital era had begun, and the classic range of Rockman products didn't sell the way they used to. The response of SR&D was the economic Ace series for the headphone amps, and a new circuit that could have become a reference: the Ultimatum Distortion. This revolutionary distortion circuit is based on two distinct clipping stage in series. The first part of the Ultimatum circuit is similar to what you find in the classic Rockman unit: compressor, clipping stage and cab sim. A second clipping stage was added, that simulates the saturation of a power section in an overdriven tube amp. The result is extremely realistic, with a rich a plain sound, full of sustain and harmonics: I have recorded several samples with the UDG stompbox, and a complete track that illustrate its great qualities. The Ultimatum circuit should have been issued as a programmable rack: a sort of super-Sustainor, merging the features of the XPR, the Sustainor and the Ultimatum circuit. This would have been a fantastic unit, but the product was only made as a prototype, as of Rockman-Central. The circuit ended into a stompbox format: that was the UDG... It's clearly an outstanding pedal, something that you keep because you just love it: you only miss that it was never issued in a rack format! The UDG sounds great as a DI unit, and can also be used in front of a guitar amp with fine results. SR&D made another pedal in these last two years: the weird Acoustic Guitar Pedal. The AGP is basically a compressor with bass and treble controls: if you compress a lot, then find the sweet spot on the treble pot, your electric guitar will ring the same way as an acoustic guitar. Don't expect the AGP to make your Les Paul sound like a Martin's or a Guild! The AGP is an extrapolation of the classic Rockman CLN2 sound, and aims at simulating the position of an acoustic guitar in a mix, more than its sound itself. Note that the AGP was re-issued by Dunlop in 1996, to answer the request of their japanese distributor. These re-issues can be recognized by their blue button, the original SR&D AGP having a grey button. 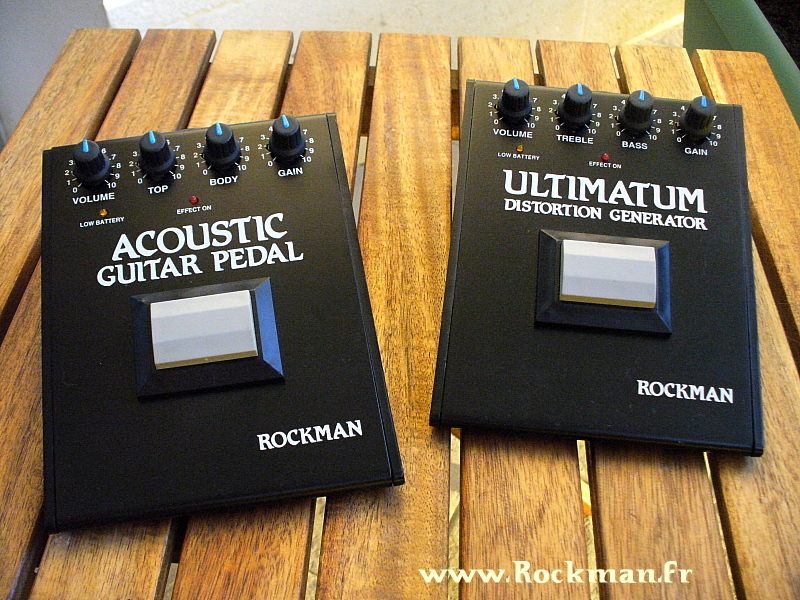 The Ultimatum circuit was also used in another weird Rockman product: the A12-50 combo. Yes, the last product of the brand who had proved that one could play guitar without an amp was... a guitar amp! 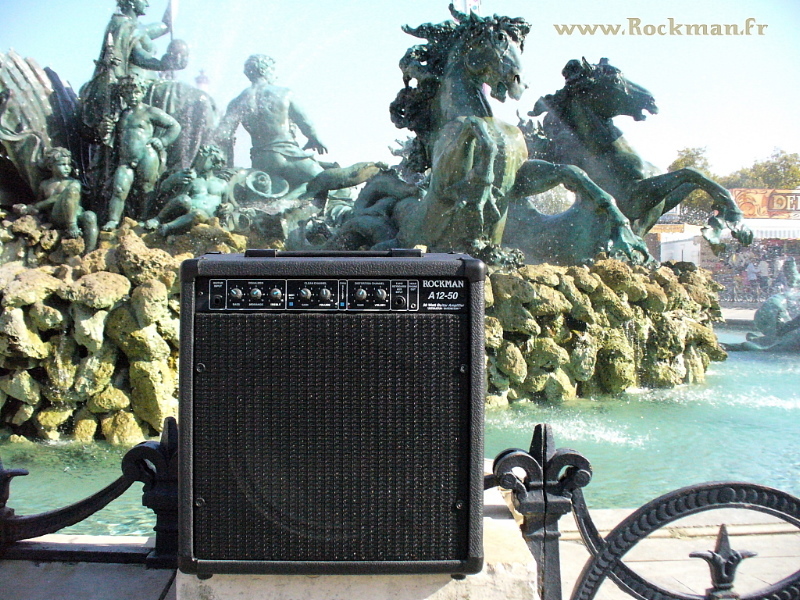 This small 50W combo is actually an excellent solid-state amp, with a sound and power that can easily be compared with its tube competitors: I've been playing with a Boogie for 20 years, and several side-by-side comparisons proved that the Ultimatum Distortion, coupled to the excellent Celestion 12' speaker of the A12-50 give results of a similar quality.